Policy & Politics Spring Highlights collection free to access from 1 February 2019 – 30 April 2019. This quarter’s highlights collection from Policy & Politics, which features three of our most popular articles, demonstrates the rich and varied scope that the journal espouses, whilst demonstrating its hallmark of advancing our understanding of the policy process across a range of different areas. Firstly, Rikki Dean’s positioning piece: Beyond radicalism and resignation: the competing logics for public participation in policy decisions, exposes the ideological biases behind various forms of public participation by presenting a new framework of competing understandings of its different forms. Rather than making the case for or against participation in general, he advances our understanding of public participation by offering greater clarity about the varied ways in which participation is constructed. The impact of this analysis is that it could help to improve participatory practices by enhancing our understanding of them as different and sometimes competing ideologies, therefore offering the possibility of reducing tensions that result from such unacknowledged conflicts. Our second featured article: Policy myopia as a source of policy failure: adaptation and policy learning under deep uncertainty by Sreeja Nair and Michael Howlett, explores that critical challenge faced by policy-makers: avoiding policy failure by overcoming the problem of an uncertain future environment which may impact adversely on policies currently being developed. In this article, the authors present a review of efforts to clarify and offset the uncertainties with which policy-makers are dealing, including building ‘robustness’ and ‘agility’ into policies, or the ability to change and adapt them over time and build capacity for better learning across temporalities. As part of their project, they set out a new taxonomy of different types and levels of uncertainty and draw out the implications of each for policy-making, along with possible corrective actions which can be taken in each case. In this way, they offer the potential to help policy-makers to avoid ‘myopic’ or short-sighted responses which are often the result of dealing with imperfect knowledge and the resulting inability to accurately predict the future. Our final article: Neoliberalism by stealth? Exploring continuity and change within the UK social enterprise policy paradigm by Alex Nicholls and Simon Teasdale, challenges the belief that the principle of social enterprise – businesses that trade for a social purpose – presents a challenge to neoliberalism. By analysing continuity and change over a period of political and economic crisis in England, the authors demonstrate how overarching macropolitical and economic paradigms, such as neoliberalism, can in fact accommodate far greater differences within a shared cognitive framework than previously thought. As a result, such policy paradigms are found to be more malleable than previously considered, and consequently, have greater longevity by virtue of their ability to adapt to shifting institutional environments. It’s this conclusion that leads them to the question in their title regarding whether social enterprises represent a mechanism that in fact reinforces rather than challenges neoliberalism ‘by stealth’. See the full collection here. Free to access until 30 April 2019. Dean, R. J. (2017) ‘Beyond radicalism and resignation: the competing logics for public participation in policy decisions‘, Policy & Politics, 45(2): 213-230. Nair, S., Howlett, M. (2017) ‘Policy myopia as a source of policy failure: adaptation and policy learning under deep uncertainty‘, Policy & Politics, 45(1): 103-118. Nicholls, A., Teasdale, S. (2017) ‘Neoliberalism by stealth? 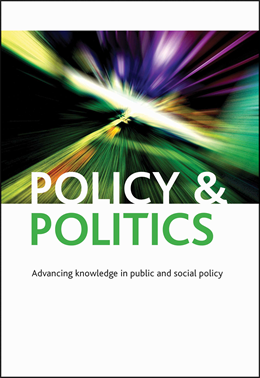 Exploring continuity and change within the UK social enterprise policy paradigm‘, Policy & Politics, 45(3): 323-341.